Fireworks can be seen over the Ohio River. OHIO VALLEY — The Division of State Fire Marshal encourages Ohioans to attend public fireworks displays hosted by local municipalities and licensed exhibitors this July 4th holiday. • Sparkler wires, which can burn up to 1800 degrees, should immediately be placed in a bucket of water to avoid injury as they remain hot for a few minutes after burnout. Other fireworks, like those sold at fireworks stores around Ohio, can be legally purchased in the state, but must be transported out of the state within 48 hours. Only a licensed fireworks exhibitor can discharge fireworks in Ohio. Those interested in becoming a licensed exhibitor must apply with the Bureau of Testing and Registration, pass an exam, and complete a background check. Applicants must submit a letter of proficiency in the handling and discharging of fireworks from an Ohio licensed exhibitor or possess a certified copy of a fireworks license from another state. An exhibition permit is required for all firework exhibitions, which is issued by the local fire chief, police chief or county sheriff. The permit specifies the date, time, location and other parameters of how the exhibition will be executed. Applicants must be a licensed fireworks exhibitor, and the fireworks must be purchased from an Ohio licensed wholesaler, manufacturer, or out-of-state shipper. Authorities inspect the exhibition site before, during and after the exhibition. Federal, state and local laws and regulations must be followed. The exhibition must also comply with the Ohio Fire Code and the safety provisions outlined in the Ohio Revised Code (ORC. 3743.50 – 3743.56). During the shoot, only registered employees and the certified fire safety official are allowed within the discharge site. Information from the Division of State Fire Marshal. 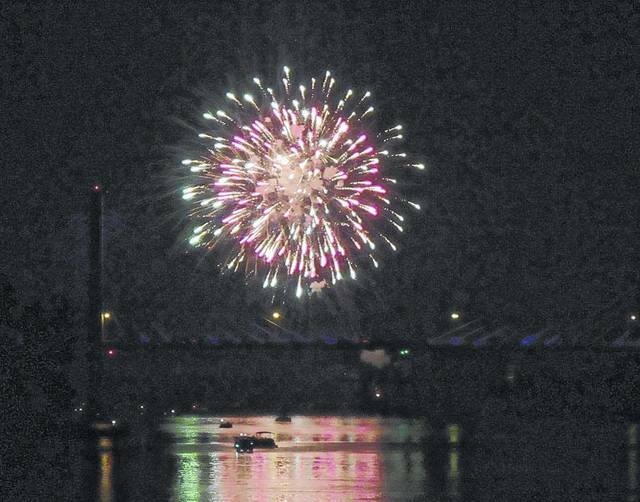 https://www.mydailytribune.com/wp-content/uploads/sites/42/2018/06/web1_7.6-Middleport-Fireworks-cropped_ne2018628151216196.jpgFireworks can be seen over the Ohio River.